Swallows are more than just pretty bluebirds that chirp sweetly in your summer garden. Sometimes known as Sparrows, Swallows have a rich maritime history even though both creatures have some slight differences, especially in their coloration. It's no coincidence that the main character in Disney's smash hit, Pirates of the Caribbean, was named Jack Sparrow. Ever since mankind first conquered that sea, the Swallow has always been one of the emblems of the maritime tradition. This is in part due to the fact that swallows were the first birds sighted whenever sailors were near land. Seeing swallows meant that a safe harbor was just over the horizon. A swallow became an anchor; a sign that, despite the tumultuous waters, everything was going to be alright. The tradition of sailors and swallows started in the British navy. Sailors adorned themselves with Swallow Tattoos under the superstition that doing so meant that they would return home safely. Swallow Tattoos also marked a significant milestone in a sailor's life. Legend has it that the more swallow tattoos that a sailor has, the further the distance he will be able to travel safely. In the early days, a sailor got tattooed with the image of the bird if he crossed the equator, successfully navigated both the Horns of Africa and South America, or had sailed the seven seas. Every 5000 nautical miles was celebrated with a swallow tattoo on your skin. Old school swallow tattoos and nautical stars are common designs in the Rockabilly culture, particularly among women. Started in the early 1950s, Rockabilly styles have absorbed many of the influences from the WWII maritime culture, including images from legendary tattoo artist Sailor Jerry and his protégé, Ed Hardy. But salty old sea dogs aren't the only people with a claim on the swallow. Ancient Egyptians revered these little birds. To them, swallows were powerful stars and living guardians of the souls of the dead. Swallows were also seen as sun animals and their presence symbolized renewal and the coming of new opportunities. This concept has been echoed throughout Christianity and several Bible verses make mention of the swallow/sparrow as a sign of Renewal and new hope at a time when Christians were persecuted for their faith. In some circles, the Swallow and the Sparrow are emblems of Jesus Christ and they keep watch over the faithful followers. The classic gospel song, His Eye is on the Sparrow, reflects this biblical concept - if the All Mighty keeps vigilant watch over the soul of a lowly bird (the Sparrow) then he will certainly keep watch over the souls of the devoted. The symbolism of a dead sparrow represents the loss of freedom. Sparrows are free-spirited and untamable. They are reputed to be the hardest birds to keep as pets, often opting to escape than stick around and obediently sing. Sparrows and Swallows were totems of the Greek goddess, Aphrodite, making them symbols of Love and Desire. Classic writers like Shakespeare were not afraid to play up this association, using these birds throughout their works to symbolize lust and passion. But despite their randy nature, swallows are also symbols of Motherhood. They are doting mothers and a Mama Swallow will do whatever it takes to protect her nestlings. Swallows and sparrows have a mixed reputation, but at the end of the day, one thing is clear; we love these chirpy little birdies. Swallow Tattoos are always bright and colorful, reflecting your sunny outlook on life. The designs sometimes feature flowers (cherry blossoms), stars, or even other swallows, and the birds are usually depicted in flight. Although both animals are used to represent the same themes, most Swallow Tattoos are blue, whereas their counterparts, the Sparrow, are darker colored. This is a way to show that you aren't stagnant in life; you are constantly in motion, much like these flighty little critters. Swallow Tattoos tend to be worn on the hips, shoulders, and upper back. Although most Swallow or Sparrow Tattoos tend to be bright and colorful, there are designs that reflect traditionally tribal cultures. Black and white Sparrow Tattoos are beautifully intricate and play up the bird's religious image and its connection with the spiritual world. 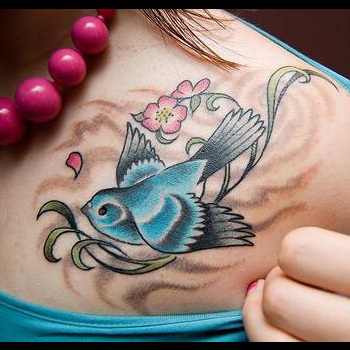 It is not uncommon to have multiple Swallow or Sparrow Tattoos on your body. For sailors, a Swallow Tattoo marked a milestone in their lives. Two swallows on the chest or shoulders (one on each side) marked a successful journey across the equator (back and forth) or the completion of a journey of 5000 nautical miles. In some places, the position of a Swallow Tattoo changes the meaning of the design. Swallows on both wrists meant that you were a seasoned and successful sailor, whereas swallows on the back of your hands meant that you were a vicious street fighter who probably did time in the slammer. Both a rose and a swallow are symbols of the Greek goddess of Love, Aphrodite. This design embodies immortal, undying love and is usually done in memory of a loved one with a maritime background (although this isn't a criteria for getting a Rose and Swallow Tattoo). Swallows are seen as guardians of the souls of the dead, making it quite a fitting tribute to lost loves and long-gone loved ones. If you want to connect with beautiful swallow, then a Swallow or a Sparrow Tattoo can help you to identify with these cheerful little birds. Swallow Tattoos aren't just for salty old sailors; they are for everyone who has left his or her heart by the sea. Thanks to the incorporation of complex elements like the use of vibrant colors and lots of flowers, these tattoos can be tricky to design, especially since each item represents a different trait. The overall meaning of your design depends heavily on the type of elements that you add to the image. If you need help creating a Swallow Tattoo that makes an impact, then contact our home page at www.itattoodesigns.com and take advantage of our Custom Design Service.